July 9, 1999 . . . . I then drilled the 6mm and 5mm cavities for the abalone fingerboard dots and glued the dots in with epoxy. July 8, 1999 . . . . 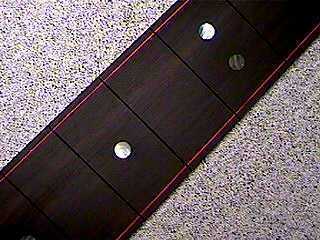 I have inlaid a thin red purfling line at the edges of the ebony fingerboard. I used Stew-Mac's purfling channel attachment, with a 1/32" bit, for one side. But then the bit broke when I had done about an inch of the second side!!! Not being able to find another bit quite the right size (I did find one in a hobby store, but its shaft was too thin to handle the ebony -- the bit wandered on my test piece), I finally ended up using the LMI side purfling cutter to do the other side. I just clamped the fingerboard edge flush with a couple of boards, to give my Dremel router base enough room to sit on, and it worked out fine (although, I admit, I was a bit nervous). July 13, 1999 . . . . 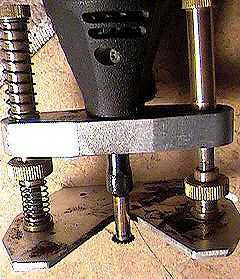 I fretted the fingerboard, using my fret press arbor in the drill press. 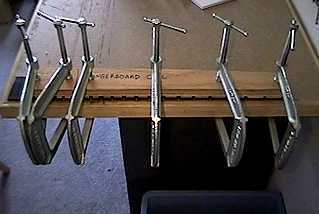 I run a bead of Titebond along the fret tang, then press the fret in, wiping away any excess glue as I go. The fretting process makes the fretboard a bit bowed back, so here I have clamped the fingerboard flat, to try to make it as straight as possible.